It’s autumn somewhere.. and time to harvest or buy beautiful apples, plums and pumpkins, make tasty preserves, and bake! Perhaps you will be surprised but I wish tomorrow (or even a whole month) would be grey and cheerless here! We I mean myself and some of my friends got a bit tired from burning sun this summer, and few days back a little miracle happened here – it was raining! Yay! But only for an hour or so. 😀 To be honest, when I lived in my hometown I didn’t like the beginning of autumn; rains were too often, boots and trousers caked with mud was a normal thing! 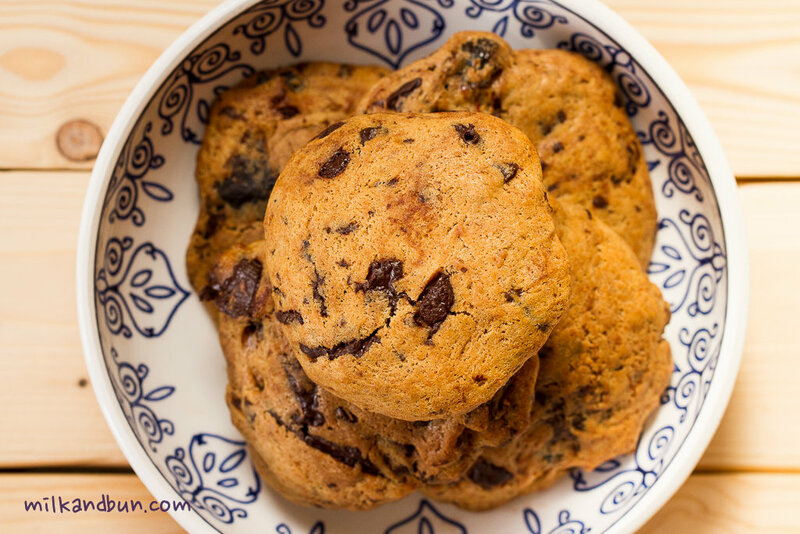 This cookies recipe is super easy, tasty and suits autumn mood! The main secret ingredient is prunes (dried plums) soaked in a cognac, and I can easily say that these cookies become my favourite! You can use dark chocolate with hazelnuts or plain milk chocolate, or even omit it. Into small pan add prunes, sugar and water. Bring to boil, add cognac and boil for 5-7 minutes more. Remove from the hob and let cool. Roughly chop prunes. In a mixing bowl, beat butter with sugar, then mix in egg. Add 2 tsp syrup from prunes. Combine flour, baking powder and salt together. Add the mixture into batter and combine. Carefully fold into batter dark chocolate, nuts and chopped prunes (without syrup). Oct3October 3, 2014 • By milkandbun • This entry was posted in Cookies, Desserts and tagged autumn recipe, baking, blog, Blogging, cookies, cooking, Dubai, food, food and recipes, food photography, food styling, Friday, photography, photos, prunes, recipes, Russian. Bookmark the permalink. Prune in cookies, and with cognac – sounds delicious. I’ll omit the chocolate though. Thanks a lot, Suzanne! They were very tasty indeed! Wow!!! These cookies look gorgeous, just like mini panettoni! !…They must be amazing!!! Never would have thought to use prunes… Great use for it! I hope you give prunes and cookies a chance:) both are very delicious! Sounds wonderful. How could you go wrong with prunes soaked in cognac?! Yes, I’ll take them with chocolate. What a gorgeous looking cookies, Mila! The first photo is really lovely! 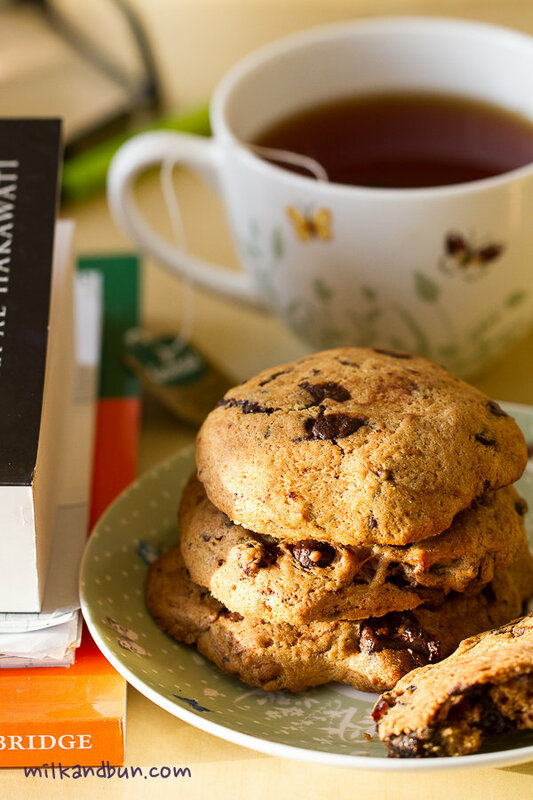 What a great recipe 🙂 There are so many chocolate chip cookies around but the twist with the prunes makes a lovely change – as does the Autumn: I agree with you that it’s lovely to see a change in the weather as the new season begins. Mmmmm! Any rain is good and these look really good too! May be with a small exception, when it’s not several days in a raw! 😀 And cookies are very tasty indeed! Thanks for stopping by! Prunes soaked in cognac, sign me up! I love, love prunes! Delicious cookies! Soaked in cognac?! Giiiiiirl, you’ve roped me in with these cookies. You go! I’m definitely saving this one for my autumn-y-est days. Cheers–so great to meet you! !